Keeping your new uPVC windows and doors clean is a really simple process. No expensive cleaning agents or methods are needed. There are many benefits of uPVC windows and doors including energy efficiency, durability, and best of all, low maintenance! That’s right – unlike timber frames that need a lot of regular maintenance like sanding, painting and varnishing, uPVC frames are very simple and easy to maintain. More and more, homeowners are looking for energy efficient and sustainable alternatives to timber or aluminium, and uPVC has proven to be the perfect material for the harsh Australian climate. In order to maintain their new and shiny appearance, it is best to clean your uPVC window frames periodically. A good rule of thumb is to clean them everytime you clean your actual windows but if that’s too often for you, then every few months will do. Simply use a clean cloth and make sure it is non-abrasive as you don’t want to scratch the uPVC. 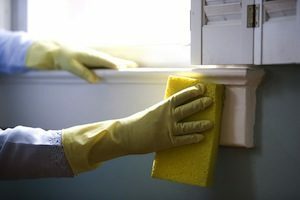 A sponge or scouring pad is not a good idea, as this can cause micro-scratches to the shiny finish of the uPVC. Next, a bucket of warm water with normal washing liquid, laundry detergent or soap. This can be diluted to the same concentration that you would for a load of dirty dishes. Never use abrasive cleaning solutions as the shiny finish of the uPVC can be very easily scratched. And once scratched, there is not much you can do. Make sure that the cloth is always wet, so that no micro-scratching occurs. Wipe down the frames and give them a good rinse. And that’s it.